Hello!!! I am slowly getting back to reality!! Things are busy---it is tournament week for my son's baseball team..which means lots of extra games; my oldest started taking piano lessons and LIKES them! (woohooo! ); and last night I dropped my blackberry into the hopper (nice, eh?) I should clarify that it was a clean toilet :) In my defense, I keep it in my back pocket at all times in case school calls, etc. and the jeans I was wearing were loose so it just jumped right out. Sigh! Last night, while I was watching TV I was playing around with the Cosmo Cricket Material Girl papers and came up with this: I love how easy it was....and how fun it was to actually stitch the squares to make them look more quilt-like! 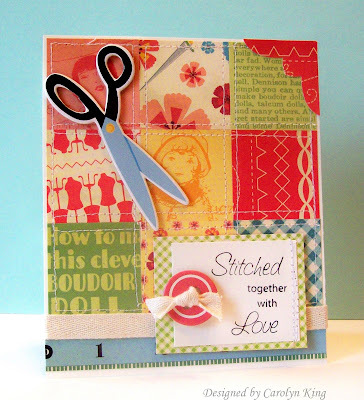 I used a sentiment from Stitched with Love Borders & Centers by JustRite Stampers. and paired it with some Cosmo Cricket Material Girl adhesive Chipboard stickers and twill ribbon. Did you know that you can find JustRite stamps and Cosmo Cricket paper at Stamper's Dream store? Materials used: Stamps- (JustRite); Memento tuxedo back ink; Cardstock-ivory (Gina K Designs); designer paper-Material Girl (Cosmo Cricket); Material girl adhesive chipboard (Cosmo Cricket); twill ribbon (SU! ); sewing machine; corner punch (Fiskars). great bright colors! sorry about the blackberry :( I am assuming it didn't appreciate the water. Like Debbie said, I love the cheery colors, wonderful card for a quilt maker. Fabulous card Cammie!Lol about your phone.I washed my son's in the washing machine,UGH! Totally cute card! I love the paper. I'm not big into stitching but I think that's because my sewing machine is under a very heavy TV. Hopefully when the basement renovation is complete we'll find something else to put the TV one and I can use it again without hauling a TV on and off it. Have a great day! How fun! Love the stamps as well as the DP!